This lesson shows you how to individually control the red, green and blue color channels of an object. In this example the UI consists of 3 sliders, for the values of the color channels, 3 label fields and an opaque graphic whose color changes. When you set the custom property in any script or the Message Box, it triggers a setProp handler, which increases or decreases the amount of red in the object's backgroundColor. For example, if you set an object's redChannel to 255, it becomes as red as possible. If you set its redChannel to zero, the object's backgroundColor has no red at all. The handler works by getting the object's backgroundColor and replacing the first item in the RGB triplet, the amount of red, with the "redChannel" value. It's easiest to understand this statement by taking it one part at a time, starting with the innermost part of the expression. The expression min(pValue,255) evaluates to either 255 or pValue, whichever is smaller. In other words, if pValue is too big, evaluating this part of the statement sets it to 255, and leaves it alone otherwise. Then, the expression max(min(pValue,255),zero) evaluates to either the value we just found, or zero, whichever is larger. The expression, therefore, evaluates to zero if pValue is less than zero, 255 if pValue is greater than 255, or to pValue itself if it's within the range 0–255. We put this value back into pValue, and now we're sure we're dealing with a legal value. The demo stack doesn't need this check, because it uses a scale bar to set the channel value, so the user can't enter an illegal pValue. But it's good practice to put it into the handler anyway, because you may use this handler in other settings, for example, asking the user to type a number, where the newValue might be out of range. 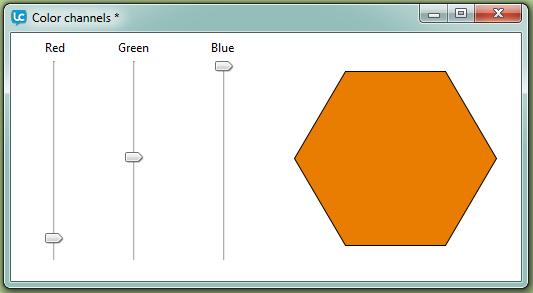 then the graphic "Hexagon" is the target. The use of the target function means you can place this handler in a stack script to apply to all the objects in that stack, or in your application's main stack script to apply to all objects throughout your application's stacks. The first item in an RGB triplet is the intensity level of the red channel in the color. Now that we have the RGB triplet as well as the new red value, we can simply put the pValue into item 1 of the RGB triplet, and then set the object's backgroundColor to the modified triplet. Item 2 is the amount of green, and item 3 is the amount of blue. Repeat this handler for greenChannel and blueChannel changing the item number. Repeat this handler for greenChannel and blueChannel slider changing the custom property name to greenChannel or blueChannel.